Metro employees prove their commitment to communities in the region every day, serving as operators, mechanics, public safety officers and many other workers who bring public transit to St. Louis. In recent years, we’ve had several employees who have come to the aid of those in very dire situations. Another Metro employee responded at the scene of a fire, finding himself able to help by being at the right place at the right time. 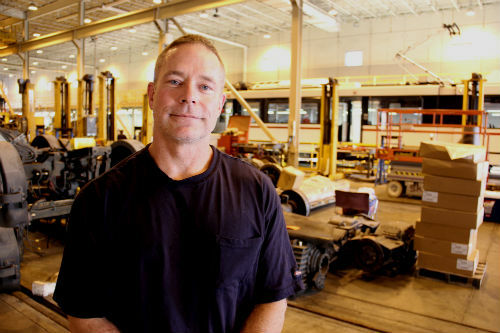 And like other Metro employees before him, MetroLink Signal Electrician Art Hammer refuses to be called a hero. On July 2, he put out a fire consuming an elderly couple’s home in Belleville and his heroic actions may just have saved their residence. Hammer, a livelong South St. Louis resident, was driving west on Highway 161 back toward the Illinois MetroLink Facility when he noticed thick, black smoke (“like burning tires”) billowing out just off Royal Heights Road. He turned toward the source, and found two police cars on the scene. A neighbor had called the police suspecting a prowler, but the light turned out to be a fire at the mobile home of Ed Wall and Debra Webber, both over 75 years old. Deputy Dan Hill and Deputy James Hendricks of the St. Clair County Sheriff’s Department responded to the call. Deputy Hill also provides security at the 5th & Missouri MetroLink Station on Saturday and Sunday nights. As the police helped the couple, Hammer took quick action with the fire extinguisher in his truck, putting out the flames that had spread from the covered porch of the home, over the outside of the bedroom and close to a nearby propane tank. He even tore back the burning plastic awning to extinguish the fire burning underneath the home. Deputy Hill told us that Hammer’s actions were instrumental in putting out the fire even before the fire department arrived. This year, Hammer (a Metro employee for one year and three months) and other employees participated in the first aid/CPR/AED training Metro sponsored at the St. Louis Downtown Airport. The Airport Fire Department taught the class and included a fire suppression component along with the first aid instruction. Hammer has recently suffered loss in his family and spoke with a great deal of empathy for the residents he helped. He even checked back up on them the following day. During his free time, Hammer works with high school and college athletes on fitness training, and bikes 50-100 miles a week on St. Louis area trails. Thanks to Deputies Hill and Hendricks who responded to the call and to Hammer’s quick actions, two local residents have several new heroes to celebrate this Independence Day holiday season. Thank you to all for your incredible service. This man rocks!! Now that is what I call stewardship!